With the Senate today passing the Defense Authorization bill with the Modernizing Government Technology (MGT) Act included, the next piece of the IT reform effort is headed to the White House for President Donald Trump’s signature. The MGT Act builds on the Federal IT Acquisition Reform Act (FITARA) to give agency chief information officers access to much-needed money to move off legacy IT systems. The MGT Act establishes working capital funds at each agency to give chief information officers a way to accumulate savings from moving off legacy IT systems and use that money for future modernization efforts. The law states the money is available for three years. The passage of the NDAA with the MGT Act as a provision comes on the heels of the fifth FITARA scorecard from Hurd’s subcommittee. Source: House Oversight and Government Reform Committee. Overall progress on implementing FITARA has continued its trend of stagnation. Only three agencies saw their scores increase, while 15 saw their grades stay the same and six saw a decrease in their marks. But Hurd said it’s hard to go from a “D” to a “F” just based on your MEGABYTE score so there are other issues that need to be addressed as well. 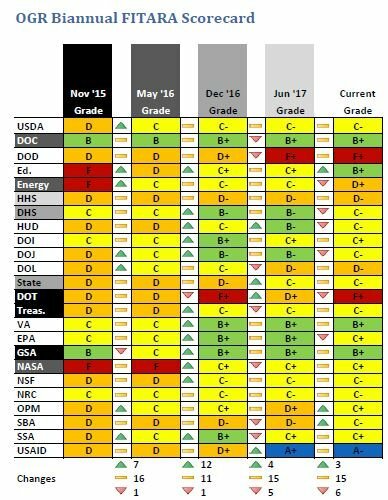 And the FITARA scorecard only will become more rigorous as Hurd said he will add MGT Act compliance next. Hurd said like with the MEGABYTE Act and the reporting structure of CIOs — whether they report directly to the agency secretary or deputy secretary — adding the use of working capital funds will give the committee and other agencies a more holistic view of the IT reform effort. “The goal of all of this is are you implementing FITARA to strengthen the CIO’s roles so that you have one person responsible for defending your digital infrastructure as well as having the flexibility to look at and improve citizen facing services,” he said. Hurd also knows that responsibility of modernizing and securing agency systems and networks ultimately has to rest across the entire C-suite of executive positions. This is why he brought in chief financial officers and agency chief operating officers along with CIOs to discuss why agencies continue to struggle to modernize IT systems nearly three years after FITARA became law at the subcommittee’s hearing Nov. 15. “So, progress is being made — just not as quick as it should be and needs to be — legacy IT is a continuing fiscal and cybersecurity risk to our nation. Though 17 agencies received an ‘F’ on this new metric for the FITARA Scorecard 5.0, it is worth noting that each of these agencies has efforts underway to create and use an inventory of software licenses,” Hurd said at the hearing. At the hearing, Energy Department CIO Max Everett told the committee that changes are coming to how the agency manages and oversees its technology. Maria Roat, the SBA CIO, told the committee that since 2016 she has been working closely with the CFO to modernize the agency. As for those agencies not making enough progress, such as the Defense Department, with three “Ds” and two “Fs” on FITARA, Hurd promised to bring them in to testify.